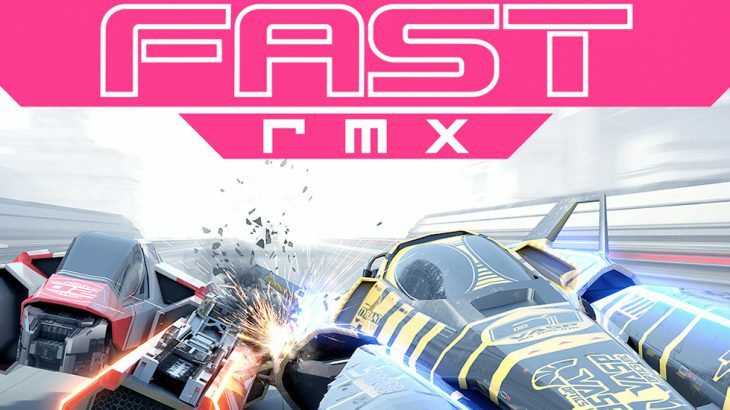 Race through a futuristic sci-fi world at incredible speeds in FAST RMX. Jump into the driver’s seat of your anti-gravity vehicle and put your skills to the test in high octane competitions. Play locally with three of your friends in splitscreen or online against 7 other players from all around the world. 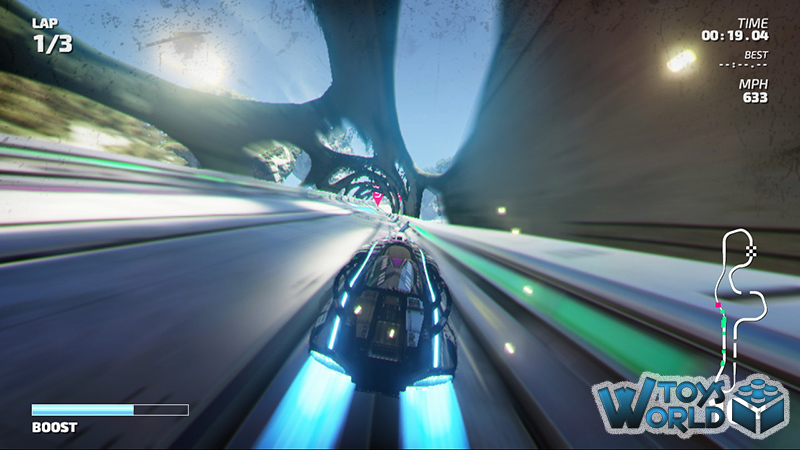 Drive through abandoned mines in the depths of the earth, to dense jungle areas, futuristic cities, crossing vast deserts and finally up into the stratosphere and beyond. Become a legend and master all courses on even the highest speed! 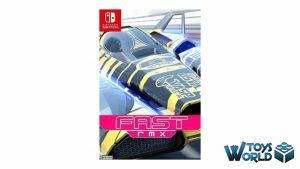 Let’s be honest; Mario Kart 8 is the racing title that everyone is waiting for on the Nintendo Switch, and whilst there isn’t that much longer to wait, our only choice of racer, currently available on the Nintendo eShop is Fast RMX. The big question is: how good a substitute is it and can it stand on its own two feet? 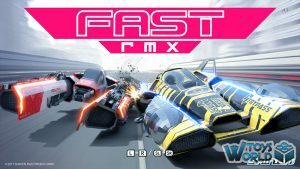 Fast RMX is a futuristic racer that feels like a cross between F-Zero and Mario Kart, whilst still, very much carving its own path. 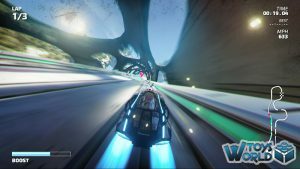 With over 30 tracks featuring cities, space-scapes, canyons, snowy peaks and more, you can select from a variety of racers that propel through the courses at break-neck speeds, coupled with truly beautiful visuals that help add a layer of realism. Add to that the fact you get an impressive 60FPS in handheld mode, it all adds up to a sharp, graphically impressive racer. 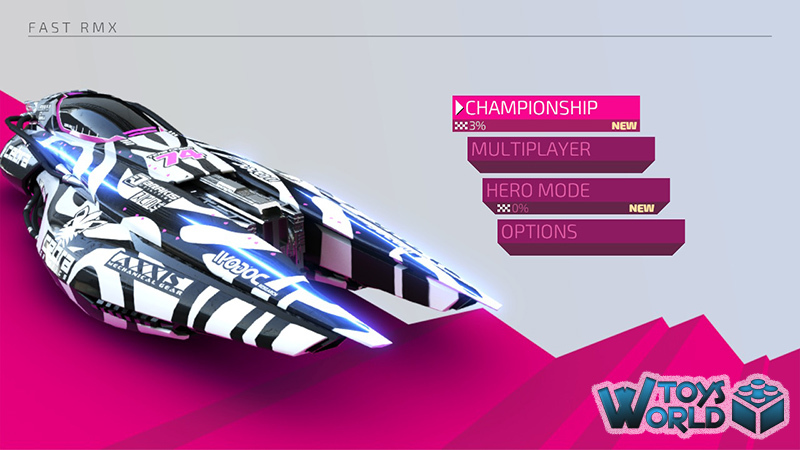 Championship mode is a great place to start and get used to the gameplay. It’s pretty easy to get going, with little knowledge needed to prepare you to race. 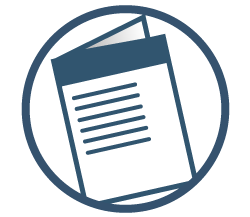 The only real element you need to learn about is changing phases; a genius element that will either speed up or slow down your racer as it glides over a blue of yellow path. 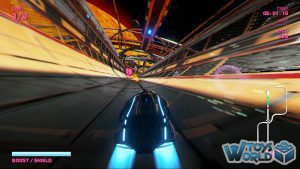 If you’re on the wrong phase, your racer will slow right down, and if you’re on the correct phase, you’ll get a much-needed boost. Collect the orbs along the way to build up your boost bar, which you can activate at any point during the race. 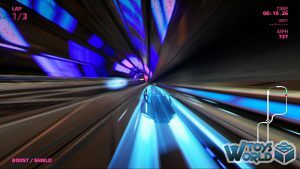 Online Mulitplayer mode has everything you could hope for, and there’s no shortage of players to join in and compete with. As with Mario Kart, there can be a little wait between races when you join, but that is to be expected. Hero mode has 3 different skill levels (Novice, Advanced and Expert), with certain targets you have to reach – each is pretty brutal, and if you crash you have to start over! To say we were pleasantly surprised by the title, would be an understatement. 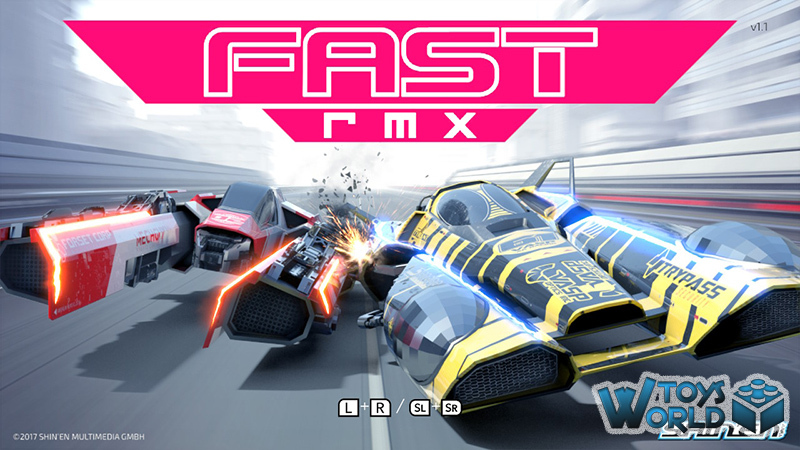 Considering the rather bargainous price, Fast RMX by no means feels like a budget title, and gameplay is incredibly immersive. 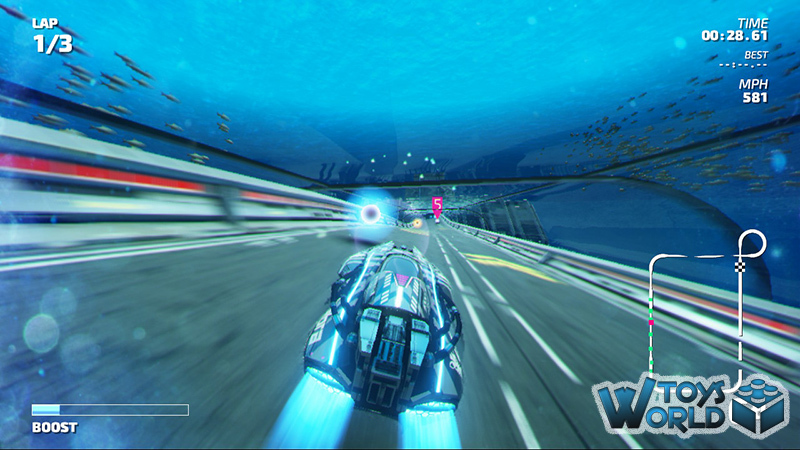 There are some lovely touches during gameplay, such as water splash fx on the screen, which adds to the realism, further. 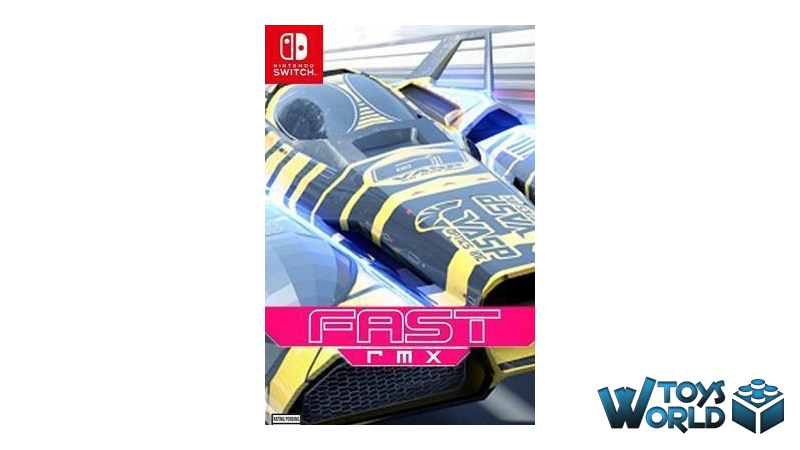 With a price tag of just £16.99 / $19.99, and despite a limited choice of games at the launch of the Switch, Fast RMX is a must-have – it’s also a game we think will stand the test of time, and even with the release of Mario Kart 8, you’ll still find yourself wanting to play it. + SUBSCRIBE to ToysWorld on YouTube! + Follow ToysWorld on Twitter! + Like ToysWorld on Facebook! 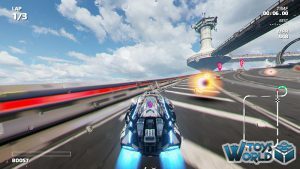 Video Games & Consoles F-Zero, Fast RMX, Mario Kart, Mario Kart 8, Nintendo, Nintendo Switch, Racer, Shin'en, Shin'en Multimedia, Switch. permalink.